The Akmerkez complex covers an area of 180,000 m² and is comprised of a four-storey shopping area, with two towers offering 14 and 17 stories of office space, and a third tower with 24 stories of residential areas. The shopping area, offering visitors close to 250 stores, is spread over a triangular area connected to the surrounding main roads through 3 atria. There are 41 escalators, 2 panoramic elevators and 30 elevators providing greater speed and easy access for visitors. The Grand Bazaar (or Covered Bazaar, Kapalıçarşı in Turkish) in Istanbul is one of the largest covered markets in the world with more than 58 streets and 4,000 shops, and has between 250,000 and 400,000 visitors daily. It is well known for its jewelry, pottery, spice, and carpet shops. 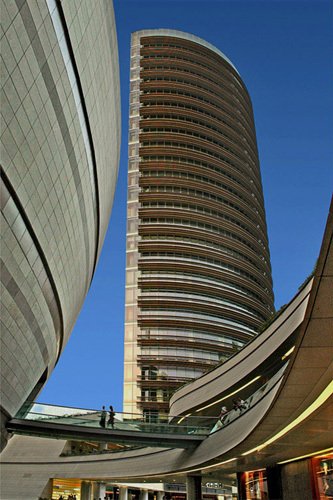 Kanyon is a multi-purpose complex in the Levent financial district of Istanbul, Turkey, which consists of a shopping mall, a 30-floor office tower (26 floors of which rise above Büyükdere Avenue level) and a 22-floor residential block. It unites 179 residential apartments, an office tower and a 160 store retail space (covering an area of 37,500 m²) to undulate around a dramatic architectural “canyon” since its debut in June 2006. Metrocity features 140 stores offering international and domestic labels, variety of restaurants and cafeterias on 4 floors with a covered area of 60,000 m². There is a MMM Migros supermarket, a department store and a strong food court. The complex’s parking lot has a capacity of 2,500 cars. Galleria Ataköy, the first modern shopping mall in Turkey, is situated in the western suburb of Ataköy, İstanbul. It was built following the recommendation of then Prime Minister Turgut Özal, who was inspired by the shopping mall Houston Galleria in Houston, Texas, USA. Galleria Ataköy was opened in 1988 by Turgut Özal.